Mr Makoto Yamazawa has been HCME President since April 2016. He is also the regional General Manager of Hitachi Construction Machinery for Europe, the Middle East, and North, West and Central Africa. 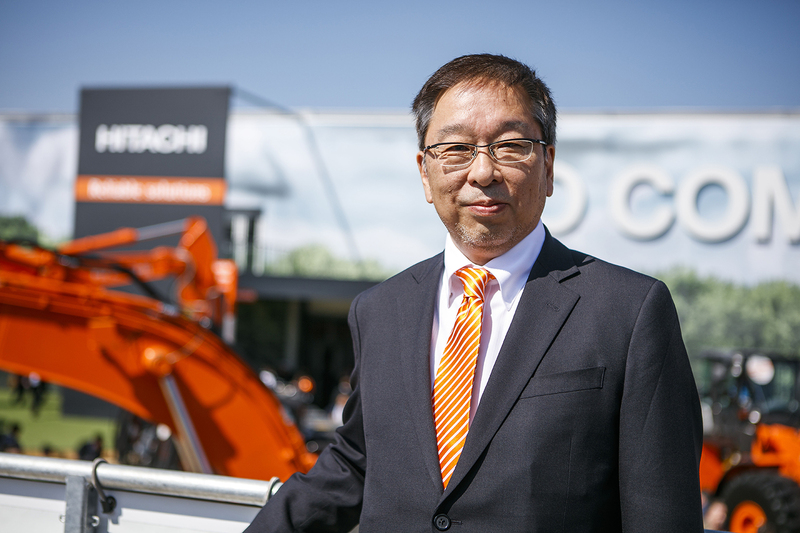 After he graduated in law from Waseda University in Tokyo, Mr Yamazawa joined Hitachi Construction Machinery Co., Ltd. (HCM) in 1983 as a sales representative for the company’s domestic business. Eight years later, he was transferred to HCM’s International Division for ten months before a subsequent transfer to the company’s subsidiary in Thailand. Mr Yamazawa held the positions of Marketing and Sales Manager in Bangkok from 1992 until 1998, and Managing Director of HCM’s Malaysian subsidiary from 2005 to 2010. In between these assignments, he took up various managerial roles at the Tokyo head office within the Asia and Oceania (1998-2000), Mining (2000-02, 2004-05 and 2010-16) and Construction (2002-04) departments. What was your reaction to your appointment at HCME? I was relatively surprised, due to the low number of mining opportunities in Europe. This is another good opportunity for me to continue developing my career, because Europe is the most stable and important market for Hitachi in the world. It is very exciting, as HCME’s customers operate everything from compaction to mining equipment and therefore this is a very similar operation – albeit on a smaller scale – to HCM. What experience will you bring to your new role? The experience I have gained at our headquarters, in our territories and with our leading product categories will help me to meet the challenges that lie ahead. While I still have more to learn about the European market, I also feel that I have much to offer from my past construction industry experience. My intention is to get even closer to our customers in the spirit of our competitive proposition. We will continue to differentiate our product and service offerings as a reliable partner and provider of solutions. This will help us to maintain our strength and profitability, despite the unpredictable nature of the global marketplace. I believe that I not only have the expertise, but also the spirit to see HCME grow. My first goal is to reinforce the enviable reputation forged by my predecessors at HCME, which was in fact established as HCM’s first overseas operation more than 40 years ago. Then, as part of the formidable team at Hitachi and the HCME dealer network, I will strive to build on the foundations required for the company to become the number one OEM over the next decade. How do you see the current market? Only a minority of Hitachi customers use their machines just to dig – there are so many applications required. So, this means that we really have to work with the factory to prepare for the increasing demand from this part of the industry. In the future, we will have to be a solution provider to help our customers earn more by being creative. What has been the most significant development in the industry? Everything is now changing on a daily basis with the increasing number of applications and telematics. The speed of technological development is so rapid that it’s even difficult for manufacturers to keep up during the development time that is required to create a new range of machines. There have already been some notable achievements in the mining industry, such as the introduction of autonomous systems. We have to be faster with our innovations than the competition. We can maintain our advantage by adopting some core technologies from within the Hitachi group and applying them to construction equipment. What have you enjoyed most in your career? In Malaysia I was able to make my own decisions and achieved so much to change ‘the game’ there. I looked at every aspect of the business to come up with new ideas and solutions. If everyone agreed, we tried it – and if it didn’t work, we came up with another idea. I learnt so much from so many people and therefore it was a very interesting assignment. What is your impression of HCME’s dealer network? The dealers are more advanced than in any other region in the world. They have to be practical and versatile, and have had to diversify their businesses due to the characteristics of their respective markets and to meet the customers’ needs. Europe is the leading region for construction equipment, because of the way in which the machines are used. With the number of solutions on offer to customers, HCME has to be the pioneer that is followed by the other regions. What will be your approach to each market? If we look at the three current major markets – UK, France and Germany – each has a different structure and it is necessary to become aligned with the dealer network in each. With help from the rest of the team and the relationships that they have in place, we can work together with the same goals and proactive action plan. And finally, what is your message to Hitachi customers? My ultimate goal is to satisfy our customers. We would like to be their partner, not just for the hardware, software and to minimise their operational costs, but also help to keep their machines running. In fact, we would like to be their best partner for solutions.